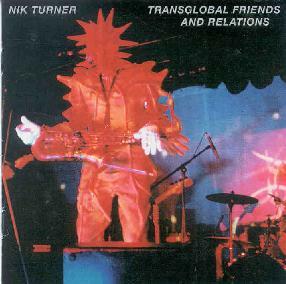 Nik Turner - "Transglobal Friends and Relations"
The first five tracks of this double-CD set were recorded in-studio in 1995. The opening track "Delay" features drummer Alan Powell on a rare vocal, and he does a pretty decent job powering this catchy semi-spacepop song. The next three tracks are based on Michael Moorcock's Elric books, starting with the mellow flutey "Sun Jester", the lyrics almost identical to Blue Oyster Cult's "The Great Sun Jester". The one that does it for me best is "Yyrckoon", an incredible monster-groove powered by ultra-funky bass-guitar based on Pressurehed's "Slow Blo", courtesy of Paul Fox. Del Dettmar provides the freaky squeaky wood-axe synth, and Nik some decent vocals. Also quite good is "Sea King", no musical relation to Hawkwind's version, profering mystical double-tracked vocals and some nice watery reverbed sax over a mid-paced rhythm section. Disc two begins with another Farflung/Nik space-rocker, "Mother Orbis", recorded at Strange Daze '97, which means reverb guitar-blasts into the universe, furious vocals, loud riffs, synth, sax and flute... Farflung and Nik, to be redundant. And perhaps a small nod from Tommy to Can. "D-Rider" is quite good, though not too dissimilar to Space Ritual '94's version, swirling synth aplenty, Len del Rio's cosmic symphonic keys, Nik's tuneful flute-playing and off-key vocals, Helios's flanged guitar-grind taking the place of Hawkwind's original celestial choir. Again, "Watching the Grass Grow", "Master of the Universe" and "Ejection" are songs that we know this bunch are quite capable of performing, and it's more solid punk-energized sonic-attack space-rock with all the screaming synth bombs and freak-out sax you could want, but perhaps a bit superfluous due to the previously-mentioned albums. It's nice to hear a live version of Farfung's crushing "Vision of Infinity". My favorite Hawkwind-turned-Nik-Turner-Band recreation "Opa Loka 2000" is of course present, and it's a fine version, but I've yet to hear one that matches the sheer sublimeness of that on Past or Future. "The Right Stuff" offers something new as Tommy does duel vocals with Nik and the twiddle-synth fires off an especially-offensive machine-gun attack. Members of California support-band Sleep join in for an insane encore of "Silver Machine". And Nik does his usual post-curfew performance, "In the Mood", but it's a bit anti-clamactic. They've now fully milked this era of space-rock, awesome as it is, so hopefully any future collaborations will spawn some new compositions and ideas for them to play around with. That's me trying to be objective. On the other hand, as a huge fan of this lot, I can't recommend this enough, especially if you're a Nik Turner's Hawkwind kompletist or if you don't have the other live albums. Cheers, Mike! For more information you can email Transparency at: transparency@disinfo.net. Contact via snail mail c/o Transparency; PO Box 81-1821; Los Angeles, CA 90081. Transglobal Friends and Relations is also available from CD Services. You can visit their web site at: http://dialspace.dial.pipex.com/andygee/cds.htm.